Powering Life. Powering Business. Powering Champions. Champion Energy’s new Smart Track home energy consumption reports help our Texas electricity customers make sense of their smart meter data. Texas electricity customers will receive a weekly email that tracks their energy usage and compares it to the prior week. Customers can use the information to make smarter decisions about their electricity usage and potentially have a lower electric bill. 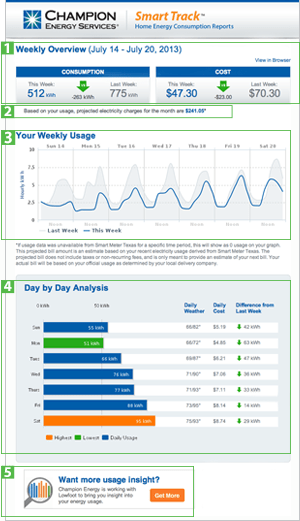 See how their usage changes week to week, so they can make decisions on their electricity usage. Eliminate the surprise of an unexpected high bill, by reviewing their daily and monthly spend, and their projected bill. Track the impact of temperature on your electricity usage. Nearly 50% of the average home’s electricity bill is cooling and heating. Gain more insight online with access to daily, weekly and monthly graphs. Champion Energy’s Texas customers with smart meters will start receiving reports in the first 2 weeks of June. Start using your smart meter to manage your Texas electricity costs today! This entry was posted in Energy Efficiency, Special Offers and tagged Electricity Costs, energy efficiency, energy saving, money saving, Smart Meter on June 4, 2013 by Champion Energy. Champion Energy Services, a Calpine (NYSE: CPN) company, is one of the largest and fastest-growing retail electricity providers (REPs) in the United States. Champion Energy currently serves residential, governmental, commercial and industrial customers in deregulated electric energy markets throughout the United States. © 2013 Copyright Champion Energy Services.